Todi is a village in the region of Umbria, in northern Italy. 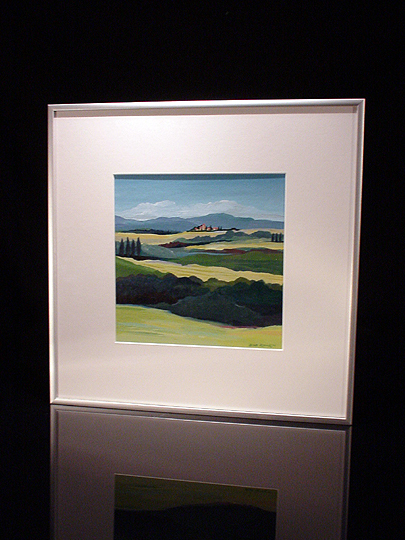 Bob spent three weeks near Todi in the summer of 1999... while he was there, he painted quite a few small works. He also took quite a few pictures, to serve as inspiration for future works. This work depicts the rolling landscape of Umbria... in the foreground, you can see some of the cypress trees that are indigenous to that region. In the distance, you can see the village of Todi itself. I can't really say why I like this work... it just relaxes me to look at it. I've been to Italy before (Venice), so I guess this work reminds me somewhat of that trip, which I took when I was in the fourth grade.